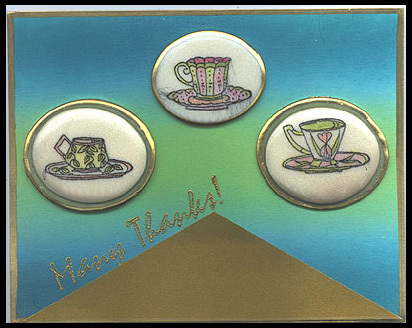 White glossy card stock was brayered with a Lagoon Kalidacolor stamp pad and “Many Thanks!” was gold embossed at an angle. Gold card stock was cut in a triangle and glued at the bottom. “Teacup #1”, “Teacup #2” and “Teacup #3” were stamped in ivory Sculpey II Clay, colored with Lumiere paint, baked, and a glaze was applied. Edging was done with a gold Krylon Leafing pen. These clay pieces were glued to the card. Clay pieces made by Susan Frank and the card made by Margaret Wiggin. The background was created by brayering glossy white card stock using a soft sponge brayer and a Twilight Brilliance pad. “Swirls Background” was stamped over the brayered piece using a Platinum Planet Brilliance pad. “Hello #1” was colored with Marvy marker #50 and stamped on the lower center of the piece. “Mimbreno Parrot #1” and “Mimbreno Parrot #2” were colored with Marvy markers numbers 31 and 50 and stamped on white glossy card stock, trimmed and mounted on foam tape over the background. This piece was layered with blue, silver and blue metallic card stock. Card by Margaret Wiggin. 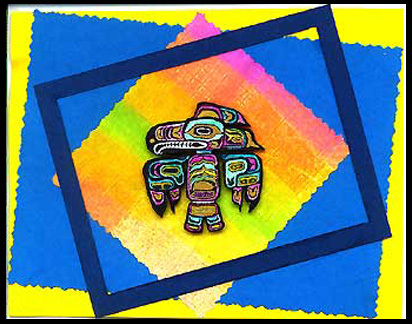 “Tlingit Eagle” is stamped with a black memories pad on white paper. All the white areas are colored with colored pencils and a gold gel pen except the mouth area and the waist which are left white. Colors used are turquoise, jade, violet and yellow. The eagle is cut out and mounted with foam tape on a piece of textured white paper that has been brayered using a rainbow pad and trimmed with deckle edge scissors. That is layered over a piece of turquoise card stock trimmed with deckle edge scissors and layered on yellow card stock. A navy blue frame is cut out and layered to frame the eagle and touch the top and bottom edges of the card. 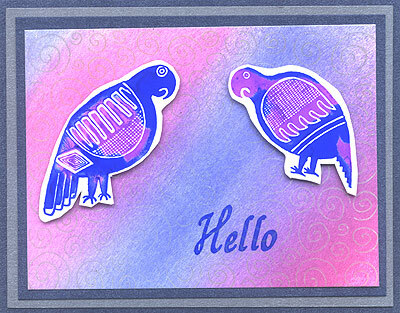 Layering each piece of card stock in an asymmetrical pattern is part of the fun of making this card as it offers an opportunity to have many variations. Card by Margaret Wiggin. 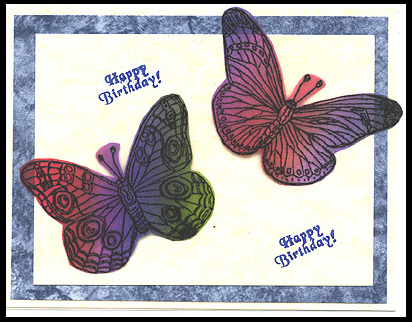 “Butterfly #1, Lg.” and “Butterfly #2, Lg.” were embossed in black on vellum that had been brayered using a Kaleidacolor stamp pad. The butterflies were cut out and set aside. Blue marble patterned wallpaper was layered on tan parchment card stock with a final layer of parchment which was stamped twice with “Happy Birthday!”. The butterflies were mounted with a thin strip of double stick foam tape so that their wings are loose. Card by Margaret Wiggin.